Car air purifiers employ a range of technologies to improve the quality of air inside vehicles by removing allergens and odors. And our team did in-depth research on each one of those technologies – including filtration, ionization and ozone – to create the list of recommended car air purifiers below. For more information about how car air purifiers work and what kind would best meet your specific needs, be sure to take a look at our helpful buying guide, which covers topics like available technologies, ease of use and maintenance considerations. Read more about our methodology. The Homdox Car Air Purifier packs tons of features into an quiet, easy-to-use, and effective device. With multiple filtration systems and an automatic air quality sensor, this air purifier drastically removes contaminants to improve vehicle air quality and eliminate, rather than hide, musty odors. 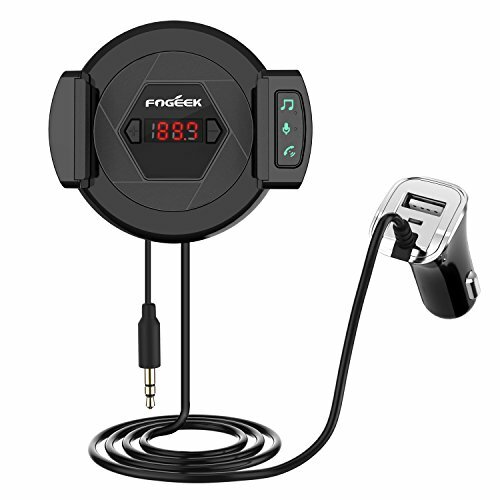 While there are many similar ionizers on the market, the FRiEQ Car Air Freshener and Ionic Air Purifier is hailed for its reliability. With its convenient plug-in design and high anion density, the FRiEQ Car Air Freshener is an affordable, efficient solution to lingering odors and allergens in vehicles. Combining HEPA filtration and high-anion density ionization, this compact air purifier is a significant step up from devices that only ionize the air in your vehicle. It’s also easy to maintain, with replaceable filters to keep your car smelling fresh. Offering three modes of air purification and filtration, along with a design intended to fit directly into most cars’ cup holders, this well-constructed car air purifier begins to eliminate odors and allergens almost as soon as you plug it in. This air purifier integrates both HEPA and HESA filtration to eliminate stale smells, tobacco smoke, bacteria, and allergens. It’s one of the most solidly built options on the market, but still runs so quietly that you will hardly notice it. This portable model, designed by a company known for home air purifiers, packs a lot of performance into a small package. Its offers multiple ionization and fan speed settings, along with quiet operation and a lightweight, portable design. The most notable difference between types of car air purifiers is what kind of technology they use to remove dust, bacteria, and allergens from the air. Ionizers emit a steady stream of negatively-charged molecules, or anions, which then force microscopic particles out of the air. HEPA filters, on the other hand, take in air and filter out those particles before recirculating the air. When shopping for a car air purifier, you want something that’s relatively simple to operate. The easiest-to-use car air purifiers are specifically designed for mobile use, with power cords that plug directly into your car’s 12V adapter. Additionally, a dependable mounting system is an important consideration: a car air purifier that slides around the dashboard or doesn’t fit conveniently in the car is more of a hassle than it’s worth. Even advanced filters can get clogged after handling a car full of dust, allergens, and bacteria. Having an easily replaceable filter is important to maintaining clean air in your vehicle, but many models don’t have filters that are readily available. For ionizers, this is less of an issue, but it’s still important to find a model that won’t break down after just a few months of daily use. Depending on what kind of functionality you are looking for, you can find car air purifiers costing anywhere from $10 to $250. Generally, the lowest-end models are small ionizers that plug directly into a 12V adapter, and most models under $20 don’t perform particularly well. In the $20-30 range, you can expect a mix of ionizers and filter-based models, with a few decent versions of each available. Once you get into the $30-100 range, the vast majority of car air purifiers combine the features of ionizers and purifiers, integrating filter systems as well as ionizers. There are still models at this price point that are strictly one or the other, but it’s more common to see devices that offer both functions. Once you get above $100, there simply aren’t that many models to choose from. Often, models in the $100-$250 range offer similar, but improved, functionality compared to lower-cost competitors, along with better overall construction. 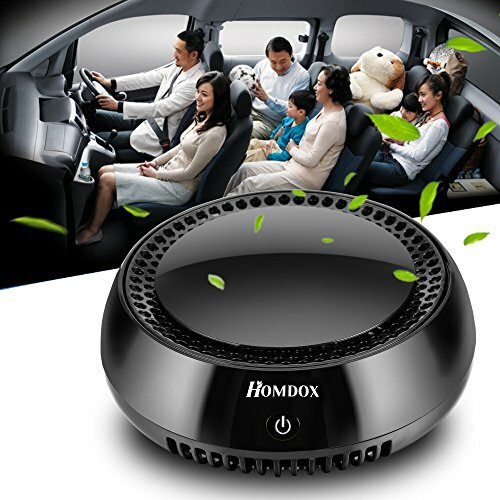 For all-around performance and dependability, the Homdox Car Air Purifier is the best choice for most buyers. While it lacks an ionizer, this model does have an incredibly effective filtration system that eliminates even the smallest particles, as well as extra features like an air quality sensor and LED indicator. It’s incredibly easy to install and set up, and only takes a few minutes to noticeably improve air quality. It also runs very quietly, especially considering its effectiveness. Multi-level filtration. The Homdox Air Purifier features two different filters to eliminate miniscule particles from the air: a HEPA filter removes airborne allergens, dust, and bacteria; the activated charcoal filter helps to eliminate lingering odors, including smoke and formaldehyde. Air Quality sensor. This device has an accurate air sensor that continuously measures car air quality and adjusts performance to ensure that air is cleaned and purified. A three-color LED indicator lets you quickly see the current air quality. Low noise. Despite circulating a lot of air, the Homdox runs surprisingly quietly. Even in a quieter car, it doesn’t produce a loud, distracting fan noise. Once it’s installed and running, it’s hard to even notice any sound. Large size. The Homdox Car Air Purifier is definitely not a compact model: it has a diameter of about 8 inches, meaning it can’t be easily mounted on a dashboard. You will definitely have to find a dedicated spot in the car to store the device, which could be a hassle in a smaller vehicle. Mounting system leaves room for improvement. Somewhat related to the larger size of this model is its less-than-stellar mounting system. While the idea of easily mounting it to the back of a seat is a good one, it doesn’t work as well as it could. Most users will probably find they would rather keep it on the floor in the back seat. 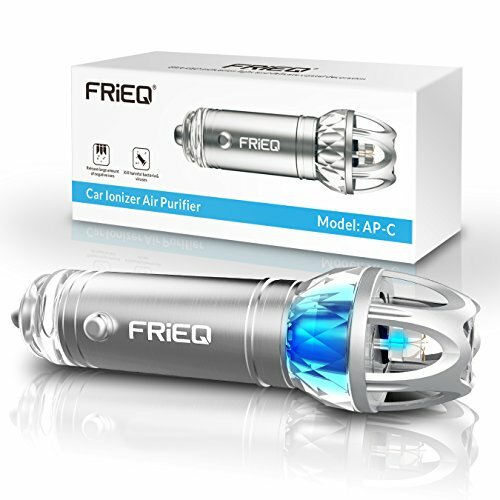 The FRiEQ Car Air Freshener and Ionic Air Purifier is a handy little ionizer that does a good job of freshening up the car. There are many models with similar designs, but this one offers the best performance at an affordable price point. It’s unobtrusive and easy to install, and it gets right to work after it’s plugged into the 12V adapter. Compact design. The FRiEQ Car Air Freshener is one of the most portable devices we looked at: it fits nicely in the palm of your hand, and it’s unobtrusive when plugged in. If you use multiple vehicles but don’t want to invest in multiple air purifiers, it’s very easy to take with you. High concentration of negative ions. The FRiEQ freshener offers a high anion density, especially considering its size. It produces 4.8 million negative ions per cubic centimeter, making it great in larger vehicles as well as compact cars. Quickly Cleans the Air. After plugging the FRiEQ Car Air Freshener in, it only takes a few minutes to noticeably improve air quality. After a full day of operation, odors are significantly reduced. Crackling sound. Because of its ionic technology, the FRiEQ does make a noticeable crackling noise while it operates. This can be a little jarring at first, and some users might find it distracting. It’s not overly loud, but it definitely produces a distinct sound. No filtration. Not surprisingly for a model that costs about $20, the FRiEQ doesn’t offer any air filtration. Instead, it simply ionizes the air. This works well for eliminating odors, but it ultimately doesn’t improve the air quality as much as a larger device that incorporates HEPA filtration. If you’re just looking to clear out smoke and odors, however, it works well. If you’re looking for a car air freshener that offers a few more features than an entry-level ionizer, you don’t necessarily have to break the bank. In fact, models that incorporate HEPA filters can run as low as $30. While models at this price point aren’t high-performance air scrubbers, they do a decent job of keeping the air fresh and clean. The Bamett Car Air Ionizer and Ionic Freshener is an excellent step up from a smaller ionizer, offering improved filtration and functionality without too much of a price increase. It doesn’t filter air as well as other models, but it does a good job of removing the most common allergens and odors. If there’s one major flaw, it’s the size of the device: it’s too big to sit on most dashboards, but small enough that it risks getting lost in the car. Multi-level filtration. 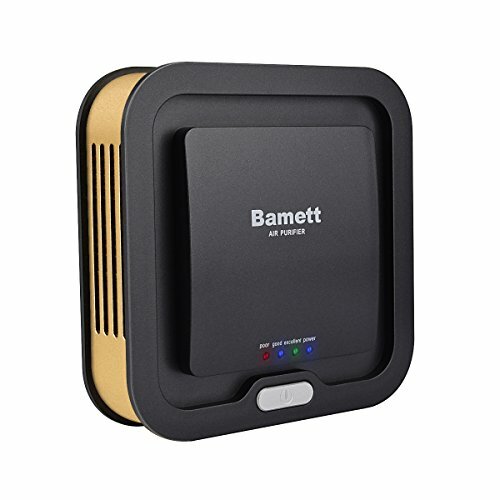 In addition to its ionizer functionality, the Bamett freshener features two different air filtration systems. A HEPA filter removes allergens, including mold, dust, and spores, while an activated carbon filter tackles odors. Combined with a high anion concentration, these filters definitely improve air quality. USB option. While the Bamett, like most other car air purifiers, has an adapter designed to work with a 12V power outlet, it also comes with a USB adapter. This is a great added feature, especially as more cars are designed with integrated USB outlets. Having this option also provides extra portability, since you can take the purifier into your home or office. Easy to use. The Bamett Car Air Freshener is incredibly simple to use: plug it in and turn it on, and it immediately begins filtering the air. It also has an air quality indicator and runs relatively quietly. Awkward size. The Bamett is somewhat awkwardly sized. It’s just a little too big to mount on a dashboard (measuring 4.65 x 4.65 x 1.25 inches), which means you’ll need to find a convenient place to set in in your vehicle, but it does not include any mounting hardware. Low power. While it does a decent job of scrubbing the air in a smaller vehicle, the Bamett Freshener is not very powerful. It will quickly clean the air in a compact or sedan, but it does start to have some limitations in an SUV or other large vehicle. Car air purifiers around the $50 mark are comparable to slightly cheaper models, but there is a noticeable increase in airflow and effectiveness. Most models in this range are designed to work in cars and trucks of any size, and usually have multiple levels of filtration and more powerful motors. Generally, air purifiers at the $50+ price point are more solidly built, using higher-quality materials and designs while offering solid all-around performance and dependability. 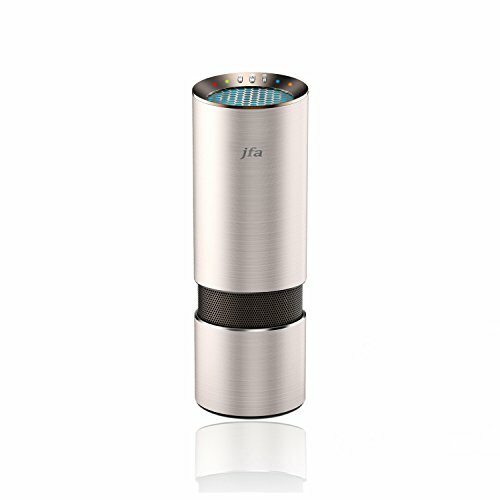 The JFA Smart Car Air Ionizer is a large, but well-designed air purifier that incorporates several filtration methods to effectively remove pollutants from the air. It also has an integrated air quality sensor that does a good job of detecting air quality levels and adjusting performance. It gets to work quickly after being plugged in, and is great for alleviating allergies and eliminating smoke smells from vehicles. Multiple purification technologies. The JFA Smart Car Air Ionizer offers a HEPA filter to eliminate allergens, an activated carbon filter to get rid of odors, and an ionizer to freshen the air. Working together, these technologies are very effective at keeping your car air clean and breathable. Extra filter included. The JFA Ionizer includes an extra filter, which is very convenient for daily users. It’s also relatively easy to find replacement filters online, but packaging a replacement with the unit itself effectively reduces upkeep costs, with no need to track down a replacement when it’s time for a new filter. Perfectly sized for cars. Unlike many of its competitors, the JFA Smart Car Air Ionizer is specifically designed to fit in most cars’ cup holders. 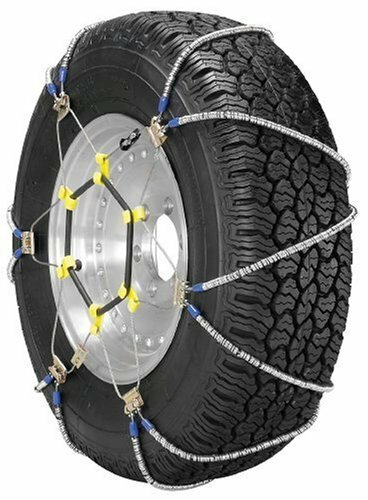 This is particularly useful, since there’s no mounting hardware to deal with and no chance of the unit detaching from a dashboard. Noticeable Odor. Most ionizers tend to have a slight ozone smell as they purify the air, but the smell of the JFA seems to be much more noticeable. It’s not necessarily a terrible smell, but if your goal is to eliminate every strange odor from the car, it can sometimes seem like you’re just replacing one smell with another. Inconvenient Filter Replacement. While the included extra filter is a nice touch, switching out the filter is not as easy as it could be. Replacement filters beyond the one that comes in the box can also be pricey, which can be an issue for users who frequently need to switch them out. Once you get into the $100-$200 price range, car air purifiers tend to have similar features and technologies as lower-tier models, but they are usually much more effective and simply better built. Many also integrate filtration systems that do a lot more than those one smaller filters. Air purifiers in this price range are definitely more of an investment, but if you have a heavily-used vehicle that tends to develop low air quality, a high-performance air scrubber may be your best bet. 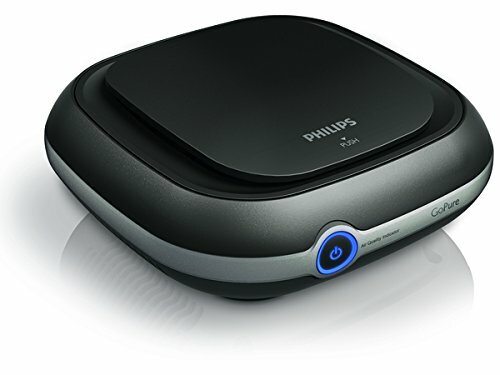 The Phillips GoPure Compact 200 Car Air Purifier is easily one of the most effective car air purifiers on the market. It gets to work as soon as you plug it in, and it only takes a few minutes to notice a marked improvement in air quality. While it’s a rather large unit, the GoPure does move a lot of air, removing both airborne particles and odors like tobacco smoke and “new car” smell. Works quickly. After it’s plugged in, the GoPure almost immediately starts to drastically improve air quality. It can eliminate smells within a few minutes, and after operating for a few days, persistent odors are completely gone. Considering its power and effectiveness, the GoPure runs very quietly. HESA filtration. While the GoPure does incorporate a very effective HEPA filter, it also includes a HESA filter to significantly increase performance. The GoPure is one of only a few models that uses this technology. Instead of eliminating odors through ionization, this filter removes odor-causing particles before recirculating the air. Multiple speeds. The GoPure features an adjustable fan, which provides some extra versatility. The high-speed setting is very effective when you first turn on the purifier, while the low setting is great for maintaining air quality without using excessive power. Expensive filters. The GoPure doesn’t come with an extra filter (although a version packaged with a replacement is also available), and replacement filters are relatively expensive. This unit doesn’t need a replacement filter very often, however, so users can expect to buy a new one about once a year. Larger profile. The GoPure Compact 200 includes mounting hardware that could be used to attach the device to a dashboard, but it seems too large to remain there. The purifier is over six inches across, and about three inches thick, so finding a spot for it can be somewhat difficult. There are not many car air purifiers that cost more than $200, but those that do tend to be portable devices from companies known for household air treatment. Somewhat surprisingly, many of the highest-end air purifiers don’t incorporate air filters, and instead produce bacteria-killing ozone to improve air quality. For people suffering from allergies or persistent issues with airborne bacteria, these purifiers can drastically improve air quality, but they’re not for everyone. While it lacks the air filtration capabilities of many of its competitors, the Air Angel does an amazing job of killing airborne pollutants using ionic technology. It’s also provides users with a lot of customization options, with an adjustable fan and multiple ion output settings. 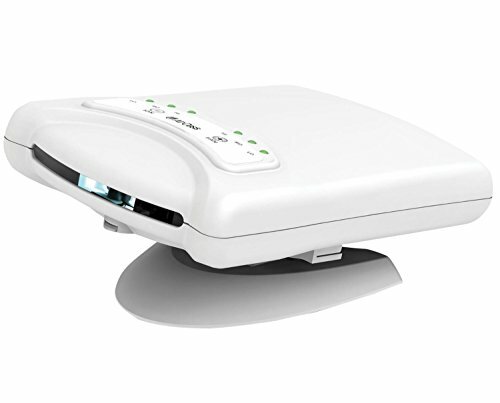 With the included adapters, the Air Angel also doubles as an office or room air purifier. Low maintenance. The Air Angel is a really well-constructed air purifier, and doesn’t require much maintenance. The cell that powers the purifier needs to be replaced once a year, but replacements are readily available through the manufacturer. Adjustable speed and output. The Air Angel is very customizable, with options to adjust both fan speed and ion output. Switching between modes is simple and intuitive, allowing users to adjust both settings as needed. Portability. The Air Angel is not strictly a car air purifier, which means it has some added flexibility. The unit includes both a 12V car adapter and a 110V power adapter, making it easy to switch from using it as a car purifier to an apartment or office air purifier. No Filtration. At this price point, it’s somewhat disappointing that the Air Angel does not have any type of air filtration incorporated into its design. It’s strictly an ionizer, which limits its overall utility if you’re hoping to really clean your car’s air. Ozone Odor. Like most ionizers, the Air Angel does produce a pretty strong ozone smell. While this is to be expected with an ionizer, the smell is much stronger than you might expect from a device this size.